Milwaukee upgraded their M18 Fuel 7-1/4″ circular saw in 2018 with a completely new GEN 2 model 2732-21HD. Is it better than the original? Let’s find out in this honest review. Milwaukee was kind enough to provide the Milwaukee M18 Fuel 7-1/4″ Circular Saw 2732-21HD at no cost for review. However as with all my reviews, I am not paid, sponsored, or obligated to give a positive review. This review is my opinion of the product based on my usage and knowledge and my review will reflect what I like and dislike about the product. I will do my best to provide you with an unbiased review. Milwaukee released the original M18 Fuel 7-1/4″ cordless circular saw back in 2014 and back then it was one of the first cordless circular saws to sport a full size 7-1/4″ blade and a brushless motor. 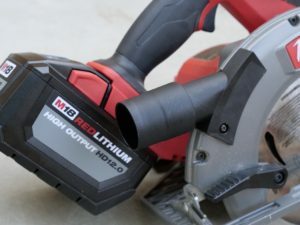 It had class leading performance in the 18V segment however the competition has hit hard with higher voltage models such as Makita’s original brushed motor X2 36 volt saw using dual 18V batteries that outperformed the original M18 Fuel model. Since then others such as Dewalt has made 60V cordless circular saws with their two Flexvolt models and Makita fired back with a X2 brushless model of their own with the rear handle worm-drive look alike style cordless circular saw model, all of which take cordless circular saw performance to a whole new level, not seen before. 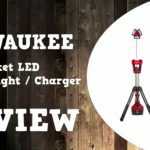 Fast forward to 2018 and Milwaukee has upgraded their original model with a Gen 2 model 2732-20 as a baretool or 2732-21HD as a kit which comes bundled with the latest in 18V battery tech, the high output HD 12.0 ah battery. The new GEN 2 Milwaukee M18 Fuel circular saw is said to offer performance similar to a corded 15 amp saw when paired with the new 12.0 ah battery. Well see if the claims are true or not in the performance section below. 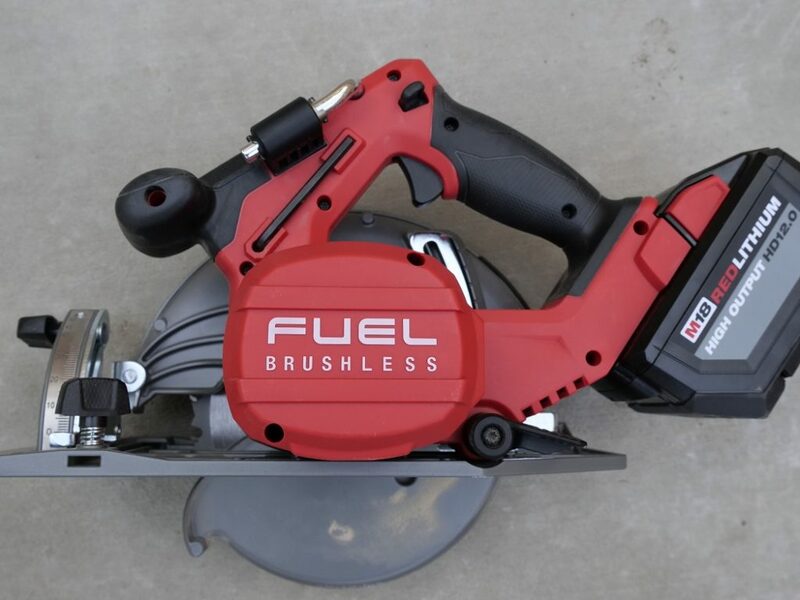 A lot of what made the original M18 Fuel 7-1/4″ circular saw great is carried over in the Gen 2 2018 model such as similar styling and features and a brushless motor (although the brushless motor itself is a different one – more on that below). In fact, so much so that it’s hard to tell them apart. Both models have a rafter hook to hang the tool next to something nearby on the jobsite such as a 2×4. Both have LED lights that help illuminate the cut line for starting cuts, however this is only useful for starting cuts as the LED light only illuminates inside the shoe cavity and not the cutting path ahead of the shoe so keep that in mind. You will still need enough light to follow through with the cut. A laser is not available that casts a line on the cut line ahead but in all fairness, this feature is reserved only for budget saw models for those that are inexperienced to the point that they need a “training wheel” feature such as a laser to aid with the cut. You will not find such a feature on a pro tool such as this Milwaukee saw. Milwaukee did very well with the construction of the saw and have not skimped out on quality as this saw features strong yet light magnesium shoe and blade guards. You wont find no cheap metals or plastics here. I also like that they included a stamped metal ruler guide in the front rather than a sticker label like Makita did with with the original X2 brushed motor circular saw (XSH01Z). The shoe seems similar to the one found on the original model which isn’t a bad thing as that was very robust, it appears it might even be the same one. The shoe allows the saw to bevel up to 50 degrees and allows the user to lock into place at any bevel angle however it does not have any detents for positive angle stops at any of the popular angles such as 45 and the like. If this bothers you, you might want to look into either of Makita’s X2 models as they have very good integrated bevel detents and stops at all the popular angles. The fact that the Milwaukee doesn’t have any bevel detents doesn’t bother me as I never cut bevel angles with a portable circular saw as I leave that job to my table saw however if I did use portable circular saws I’d greatly miss the detents. But then again the Milwaukee’s shoe has a bevel degree scale to help find the angle you need, albeit with no hard stops. The shoe also has a built in slot to use with rip fence guides and a knob is built in to tighten a fence guide, however a rip fence guide is not included and will have to be bought separately. Some might miss an included rip fence guide including me, but to me it’s not that big of a deal as I use my table saw if I need perfectly straight cuts at certain widths. For everything else my cuts are straight enough with a portable circular saw. 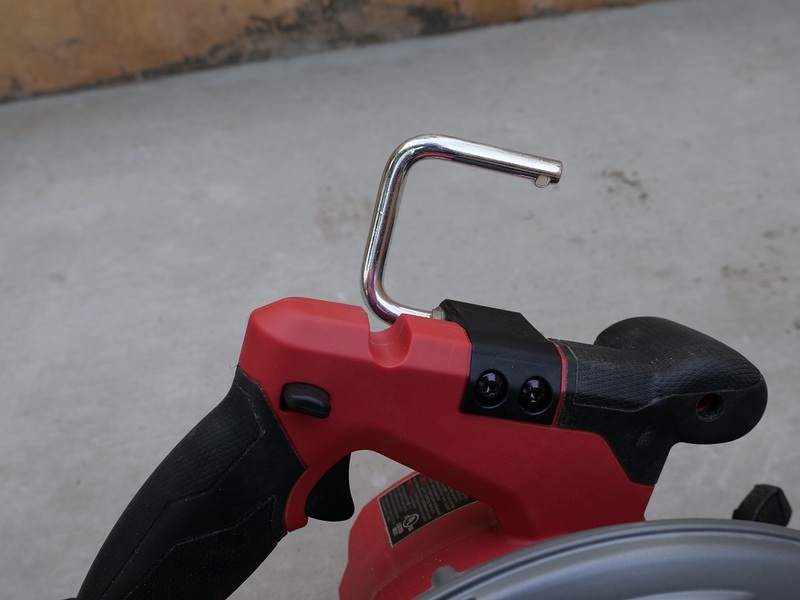 The Milwaukee M18 Fuel saw also comes with a hex key included to swap blades, and like the original model has built in storage for the key so it’s always on hand. The handle is also very similar with a nice hefty grip to hold on tight and a fine texture on the rubber overmold for a tight grip. I don’t know if it’s just in my head but the new saw’s handle seems a bit slimmer, hard to tell but still good. The trigger is also activated only after the thumb safety button is activated with a thumb safety button on either side of the grip for right and left handed users. Also just like the original model, the blade is to the right of the saw like a traditional sidewinder model. Personally I prefer the blade on the left side since I am right handed but it’s not a big deal as most of us right handed users have been accustomed to using blade right circular saws. I do however wish that Milwaukee would make a right handed version of this saw with the blade on the left side. There were three physical differences that I found on the new model. The first one is that the motor is larger, roughly about twice as large as the original model which also leads to the next difference which is weight as the new saw is about a pound heavier at about 9 lbs without battery. That makes it about the same weight as the original model with a 4.0 ah battery, but without a battery. When you install the included battery which is around 3 lbs by the way, it makes it a hefty saw at 12 lbs with battery, yikes! 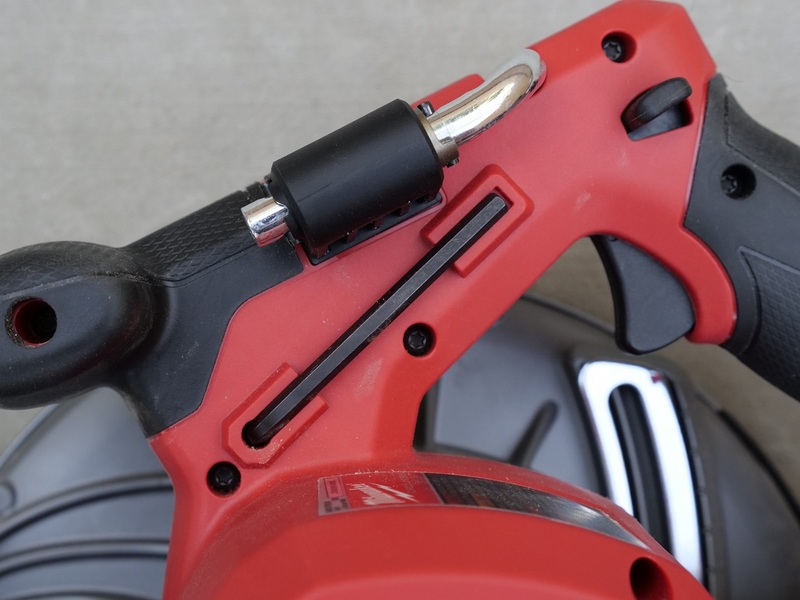 That has always been one of the positives about cordless circular saws is that they were always lighter than a corded model, but that has changed with the Gen 2 model. It’s still light at about 10 lbs with a fatpack battery like an XC 4.0 or 5.0 but then again, Milwaukee makes the claim that it’s as powerful as a corded 15 amp saw only with a 12ah battery, not with a 5.0ah battery. But don’t worry, I compare both 12ah and 5ah batteries in the performance section to see if there is any difference in performance depending on battery size. But either way you look at it, this is a heavy saw for cordless when paired with a 12ah battery. Luckily the handle is closer to the center of the saw making it evenly balanced and not front heavy when holding. 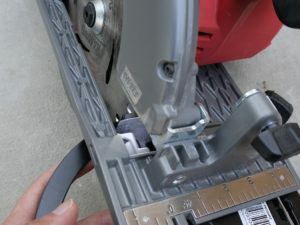 The same is not true about Makita’s X2 rear handle saw which weighs about the same but because the handle is extended to the rear, makes the saw unwieldy when holding with only one hand since it’s entirely front heavy. Still, it’s too bad the Gen 2 Milwaukee Fuel model isn’t lighter. The last difference I found on the new Gen 2 model was that the side dust chute on the upper blade guard now has a plastic insert installed. Why is a cheap plastic insert installed? It’s so that you can swap that out with an included vacuum port accessory for cutting with less mess when using a vacuum. This is a very well designed accessory and when used with a vacuum will lead to cleaner jobsites and less mess to pick up at the end of the day. What’s also interesting is that this is a feature usually only found on UK and similar market’s circular saws and traditionally was a feature absent in USA models. This is a big deal to us Americans. The Gen 2 Fuel circular saw is priced at $399 in the one 12ah battery kit. This makes it a bit more expensive than one of it’s peers but not by too much and the same as one of it’s other peers. For example the Makita XSR01 kit is priced at $299 and it comes with two 5ah batteries and dual charger making it an entire benjamin cheaper than the Milwaukee kit, however I will say that the single 12ah Milwaukee battery is larger in capacity than two 5ah Makita 18V batteries by 2 whole amp hours so the difference in price isn’t that big after you factor in that the Milwaukee though pricier offers a larger battery. Next on the list is Dewalt’s 60V Flexvolt cordless worm-drive style circular saw which is priced at $399 in kit for with one 3ah Flexvolt battery which is equivalent to 9ah in 18 volt terms. 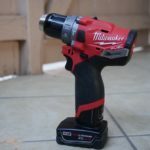 Priced exactly the same however the Milwaukee offers the better value as it’s bundled battery has a larger capacity by 3 amp hours more than Dewalt’s. So Milwaukee’s $399 price point for the kit is actually not bad considering the bang per buck. One thing that’s interesting to note is that while other brands like Makita and then Dewalt came out with pseudo worm-drive cordless circular saws. I’m sure they no doubt went with these fake worm-drive styles to give the impression that they were more powerful cordless versions. Fortunately, I was able to test out Makita’s X2 rear handle circular saw that has fake worm-drive styling. And yes it’s worm-drive looks are fake as it does not have a worm-drive and is actually a sidewinder saw made to look like a worm drive saw. However, the Makita X2 rear handle saw did prove to be a very strong cordless circular saw, much more so than the already strong original X2 model. So while the worm-drive style looks do give users an impression of strong performance, that model does have the performance to back up it’s looks, it’s fake worm drive style looks have nothing to do with it’s performance, but instead has to do with a strong motor in a sidewinder configuration. 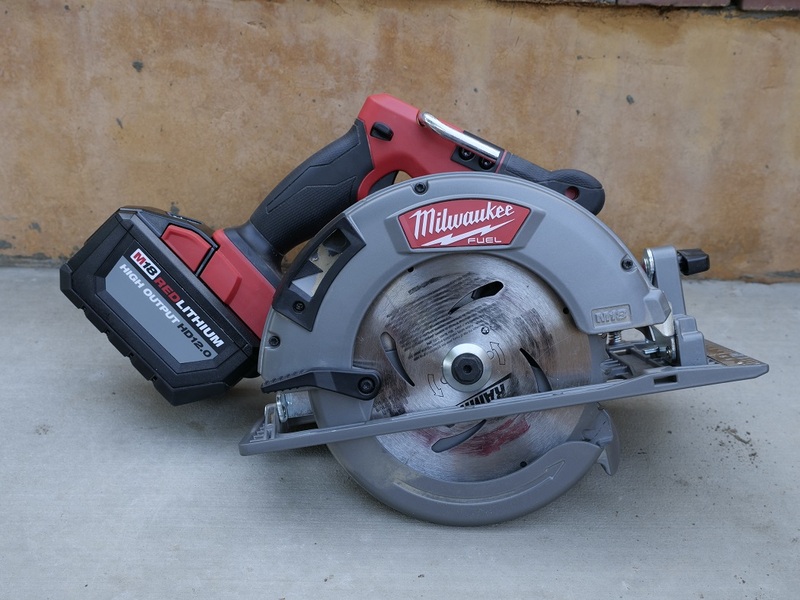 Going back to Milwaukee’s 2018 Gen 2 M18 Fuel circular saw model, Milwaukee did make it stronger motor over the original Fuel model but yet kept the standard sidewinder style. Personally I like this direction as this saw is not trying to bait you into thinking you’re buying something that it’s not. However it’s traditional sidewinder looks do not tell you it’s more powerful over the original especially since it looks almost identical to the original, only Milwaukee’s marketing department does. 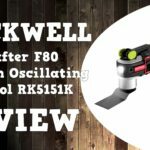 Luckily for you guys, I’ve tested this saw out and can tell you if it’s actually more powerful over the original and by how much AND if it can keep up with the higher voltage competition including the pseudo worm-drive look alikes. Enter the performance section below. So the first thing I do with all my circular saw reviews is to test them while cutting 2×4’s to get a general sense of how powerful they are and also to test for runtime (how many cuts they can make before the battery runs out). As I made my first several cuts, I noticed this saw was strong. So powerful it was able to cross cut 2×4’s in less than a second each cut and with hardly any drag even with an average blade. Milwaukee supplied me not only with the included Milwaukee OEM blade but they also sent me one of their fancy new white blades but I test new circular saws with the same type of blade on each saw (but new) not only for consistency but I choose an average quality blade (Avanti Pro framing blade) so that I can determine how strong a saw is rather than blame excellent cutting performance due to a better blade if the blade is engineered to cut faster and smoother. I also constructed a new test board piece made up of 5 stacked pieces of OSB glued together. 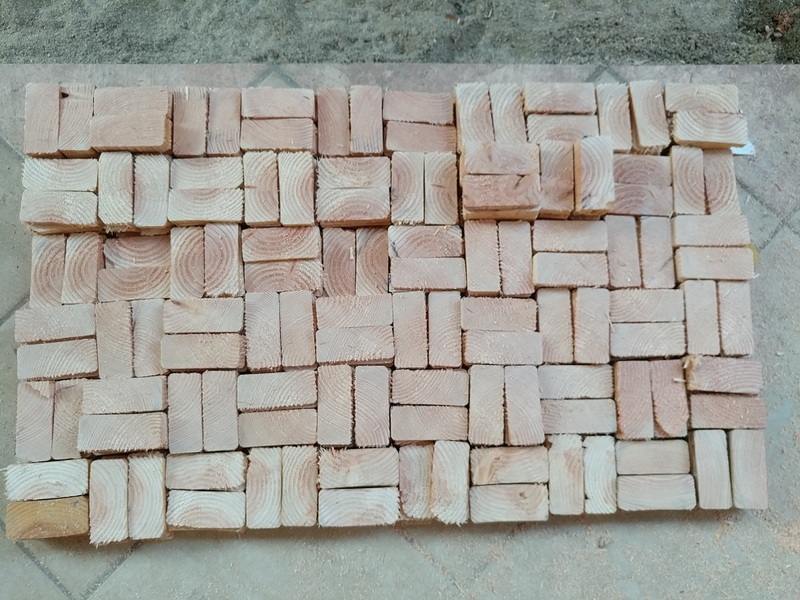 The thickness of this piece is 2-1/4″ and the length is 24 inches, so each cut is 24 inches long at a thickness of 2-1/4″ inch. The original Milwaukee fuel was able to cut through a similar test, however the original piece was only 4 pieces of OSB stacked and was not glued together. This poses as a stronger stress test for any circular saw and yet the Gen 2 2018 model was able to fly through the cut at just under 4 seconds, wow! This new Gen 2 model has serious huevos! You can see both tests in the above video if you don’t believe my words, at least you can believe your eyes. As I commented earlier, Milwaukee makes the claim this saw has performance similar to a corded 15 amp circular saw when paired with the new 12ah battery. I believe this claim as it’s performance easily backs it up. But then that got me thinking, would this same saw perform the same or similar with a smaller battery? I know many of you still have XC 4.0’s and 5.0’s since the newer 9.0’s barely came out and the new 12.0 literally just came out this year so how does this saw perform when used with a smaller more common fatpack XC battery? I ran the same stacked OSB test with the XC 5.0 ah to find out and surprisingly this saw is just not nearly as powerful as when paired with the 12.0 ah battery. In the same test but with 5.0 ah battery, it took the saw over 9 seconds to do the same stacked OSB cut test. That’s more than twice the time it took the saw with the 12.0 ah battery. 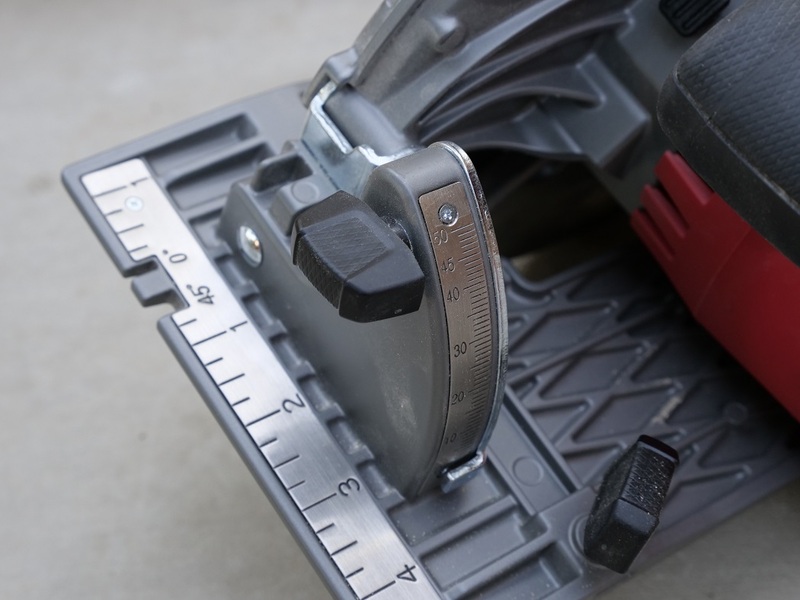 This means that this saw is optimized for use with the larger 12.0 ah battery. As seen in the above video, yes you can use smaller batteries as it’s still backwards compatible with all M18 batteries, but if you want to take full advantage of this saw’s raw performance, you can only do so with a 12.0ah battery. Other performance features include an integrated dust blower to keep the line of sight ahead nice and clear and it works good on this saw. It does what it’s supposed to do with no problems. It also has a side dust chute which does a pretty good job at spitting dust outward to the side as it cuts. Although not all the dust makes it out the side dust port with some of it falling behind the saw. I found this to be a bit of a nuisance as I had to dust it off the work piece several times. Not the biggest of deals but it had to be done and I’d prefer not to. Recently I was able to test out Makita’s latest and greatest cordless circular saw, the rear handle XSR01z model. Up to that point, that saw was the best I had tried, and by a long shot! Getting much stronger performance than even the still strong X2 brushed motor XSH01z model. However when I tested that saw and previous saws, I had run out of the board I had built with 4 stacked pieces of OSB, that and I forget to measure how long the cutting length was so I couldn’t recreate that cut perfectly on new tests. But luckily I still have that saw and others including the still new Makita X2 brushless rear handle beast of a saw so I can test with my new 5 stacked piece of OSB glued together. The fastest cut on the new test piece was about 4 seconds with the Makita X2 rear handle saw using a pair of 6ah batteries which is still very darn fast and powerful, however the new GEN 2 2018 Milwaukee M18 Fuel model surpasses even the Makita X2 rear handle beast just by a bit making it slightly more powerful. What doesn’t make sense is that the Milwaukee is an 18V saw while the Makita is a 36V saw, so how could it be an 18V model is more powerful? Whatever it is, you have to give props to Milwaukee for doing the impossible. And to satisfy my curiosity and yours, I also tested the original M18 Fuel model but with the new 12.0 battery and the original Makita X2 brushed motor circular saw XSH01z with a pair of 6.0ah batteries under the same stress test. What was interesting is that the Makita XSH01z kept up very well just slightly behind the new brushless X2 rear handle model at about 5 seconds, no doubt thanks to the pair of 6ah batteries. The original Milwaukee M18 Fuel saw was easily the slowest at 8 seconds with the same test cut. This shows us that the new 12.0 ah battery is not the only reason the new Gen 2 model is so powerful, it’s also because of a stronger motor as well because the new larger battery doesn’t automatically make the older M18 Fuel model perform like the 36V saws. While the Gen 2 Milwaukee M18 Fuel 2018 circular saw model is technically faster than the Makita X2 rear handle saw at handling demanding cuts, I will say that the Makita X2 brushless rear handle model seems faster in real world use. How so you ask, especially since the above comparison video shows the Milwaukee Gen 2 model beating all others? It’s simple really, because even though the Milwaukee is technically faster, the motor sounds like it’s getting pushed to the limit when making demanding cuts and sounds like it will give out at any moment unless you slow down the cut. The Makita on the other hand, even though slightly slower, doesn’t feel strained when making demanding cuts as you can hear the motor whizzing at full strength throughout the cut. The Makita inspires confidence when making a demanding cut and makes you feel like you can push the saw harder, although you can’t go faster than the above video even if you tried otherwise it will overload and stall (yes I tried it and that’s what happens). While the Milwaukee Gen 2 feels like you need to lay off the speed so as to not overload the motor, even though it cuts faster. However, either way you look at it, this Milwaukee M18 Fuel 2018 Gen 2 model not only can hang with the big boys, it can outrun them, even if it sounds like it’s struggling when pushed to the max! The runtime on this saw when paired with the new 12.0 ah battery is simply incredible as it was able to make 6oo cuts into 2×4 with one battery! This means it gets about 50 cuts per amp hour. 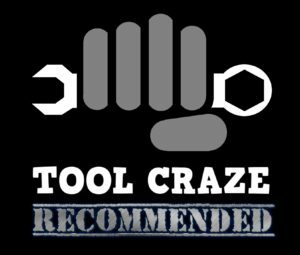 One thing people always told me (that have tried cordless tools in the past but not today’s cordless) is that cordless has a short runtime, along with poor performance. We’ll let me tell you guys something, the day’s of cordless tools with crappy runtime and crappy performance are over. The M18 Fuel 2 Gen model in this review is a fine example of this regard. With 600 cuts per charge, that’s at least 3 work days straight if not a whole week of cuts without having to change the battery. That makes this the saw with the best total runtime I’ve tested so far – easily! And I’ve tested some with quite impressive runtimes in the past such as the original M18 Fuel 7-1/4″ circular saw with 9.0 battery at 456 cuts into 2×4 making it 50.6 cuts per amp hour. The Makita X2 XSR01Z also got an impressive 458 cuts into 2×4 with a pair of 5ah batteries making it about 45.8 per amp hour in 18V equivalent terms. I’ve said it before and I’ll say it again, Milwaukee’s been up to their technological wizardry by pushing the limits of what 18V can do and offer performance similar to high voltage cordless power tools and the 2018 Gen 2 Milwaukee M18 Fuel circular saw is yet another example. Honestly, after trying the Makita X2 rear handle circular saw which is a 36 volt tool by the way, I thought there would be no way any 18 volt tool could ever come close to it’s performance but yet here we are today with the Milwaukee not only coming close to it in terms of performance, but slightly edging it out in terms of cutting speed in high demand cuts as seen in my 5 stacked OSB test. It’s runtime is also fantastic with 600 cuts into 2×4 tested with the bundled 12.0 ah battery. This is a full featured saw with quality components such as magnesium shoe and blade guards, integrated flip out rafter hook, LED light and brushless motor. All is not perfect though, as powerful and fast as the Milwaukee saw is – it can handle very demanding cuts but it sounds like the motor is being taxed. It still competes with and slightly outperforms even the mighty Makita X2 rear handle saw however the Milwaukee doesn’t exactly give you confidence when maxing out it’s performance, while the Makita X2 rear handle saw (with slightly slower cutting speed) gives the user confidence to power through demanding cuts because it’s motor does not seem stressed the slightest. 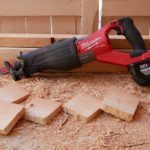 Either way, at the end of the day, the Milwaukee M18 Fuel Gen 2 circular saw is one of the strongest and fastest performing cordless saws on the market and it’s hard to believe that such performance can be squeezed out of an 18 volt tool. I do like that Milwaukee’s new Gen 2 Fuel Circular saw doesn’t try to fool you into thinking you’re getting something it’s not. They didn’t do what Makita and Dewalt did by making it look like a worm drive saw when their’s are in fact not true worm drive saws. Makita and Dewalt’s rear handle worm drive style saws are purposely made larger in size to make you think they are better. Sure the performance part is true on those saws but they really don’t need to be so large because they don’t offer a real worm-drive configuration – so the large size on fake worm-drive saws is not necessary. 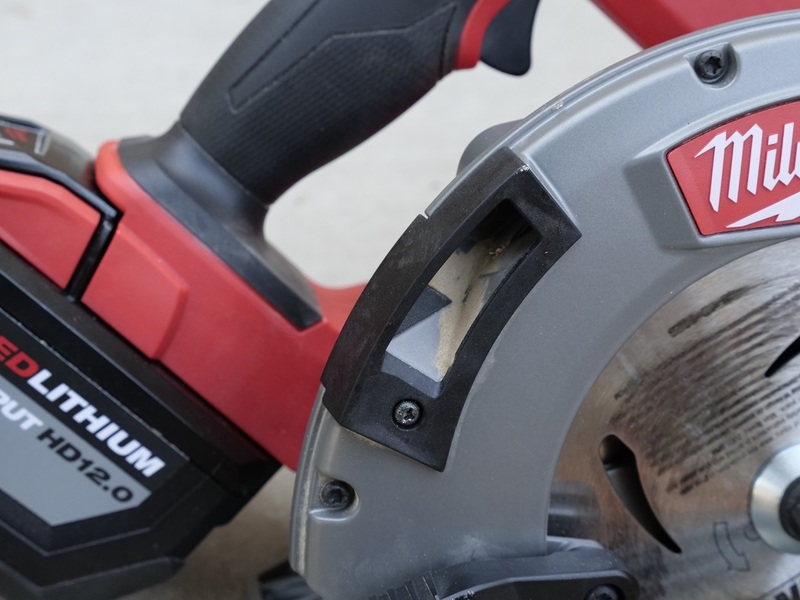 One big drawback of the Milwaukee M18 Fuel Gen 2 circular saw is that to take full advantage of it’s strong motor, you NEED to pair it with the new 12ah battery if you want class leading cordless performance. If you plan on using this saw with smaller batteries, it will simply not perform anywhere near as good as with it’s 12ah battery. It’s still a powerful cordless saw even with a smaller battery such as an XC 5ah battery but simply not as fast, yet it can still handle the same demanding cuts but at a drastically slower speed. It’s weight with a 12ah battery makes it heavy for cordless circular saw at 12 lbs. Compare that to the 9 lbs of the original M18 Fuel model with XC 4.0 battery. Sure, you can place a smaller lighter XC battery on the Gen 2 model to keep the weight down to 10 lbs but then you sacrifice lighter weight for decreased performance. Still 12 lbs isn’t that bad and since it’s a sidewinder makes it have a balanced center of gravity making it easy to hand hold it one handed. However even though it has a couple of drawbacks, it’s still noteworthy that as a whole, it delivers not only outstanding performance in any voltage class, but the fact that it’s coming from only 18 volts is incredible. That plus extreme runtime and although it’s not exactly cheap at $399 in a kit, it offers a good bang for buck value. 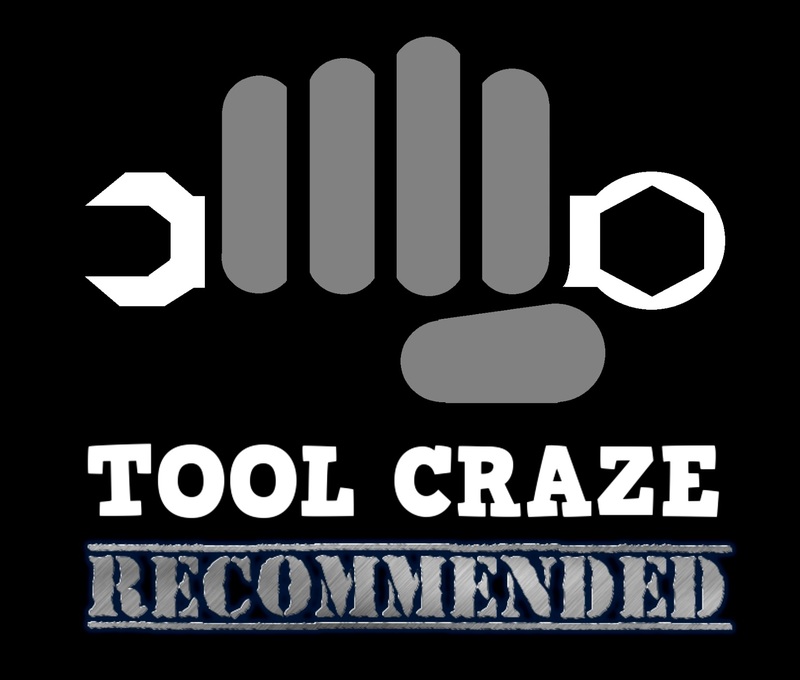 Because it’s positives outshine a couple of negatives, I can easily give this saw a recommendation! Yes, I think you are correct. It’s a perception thing based on old school thinking. Now,I am old, but I cant really see any connection between power and blade orientation, lol! We have very few options so people really have no choice but to buy a blade right if they want a bigger saw. It really is beyond ridiculous. If they offered both, it wouldn’t take long for the blade left sales to overtake blade right.